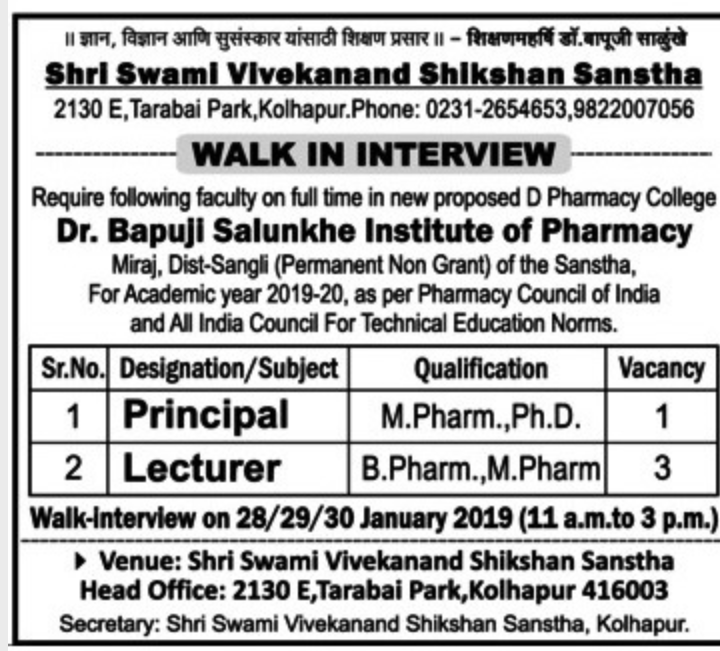 Dr Bapuji Salunkhe Institute of Pharmacy,Kolhapur,Maharashtra has advertised for the recruitment of Teaching Faculty- Lecturers,Principal job vacancies. Interested and eligible job aspirants are requested to walk-in 28th,29th,30th January 2019.Check out further more details below. 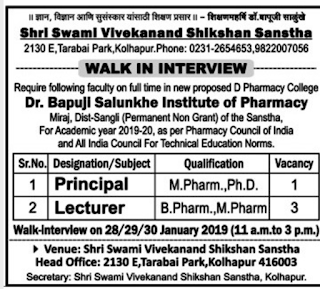 Name of the College: Dr Bapuji Salunkhe Institute of Pharmacy,Kolhapur, Maharastra. About College:'Shri Swami Vivekanand Shikshan Sanstha, Kolhapur' is one of the few renowned and leading educational institutions in Maharashtra (India). Dr. Bapuji Salunkhe started toying with his dream- project of founding an educational institute which he did in 1954. He made the resolution of founding 'Shri Swami Shikshan Sanstha' in a small temple of Lord Muralidhar (Lord Krishna) Situated on the confluence of holy rivers the krishna and the Koyana. He selected equally holy place to begin the sacred mission which, later on, become a life-time work for Dr. Bapuji Salunkhe.